A Little More Than Ordinary...: "I Remain the Boss!" visitors who voted for me..
and thanks to SiS of Few Miles..
" I remain the Boss"..
And congratulations on becoming King of Haiku Challenge! A great truth in your words. And congrats. Congratulations, Sir! Very well deserved. Congratulations. and set of Haiku above are excellent reminder of ways of life, truth of life. Well deserved Congratulations!! It was a fun challenge. It gave me a chance to read more of your work. Your joyful spirit added depth and dimension to our month. Happy Sunday! Hey Ramesh, Congratulations!!!! Haiku King!!! You're the BOSS!! Nice write! Congratulations on the award! P.S. : I have e-mailed you at your rediff id, Rameshji. And your haiku rings true. Nature will win in the end. Concratulations to you, sir. Well deserved. Congratulations on a well-deserved award Ramesh...you are indeed the King of Haiku! 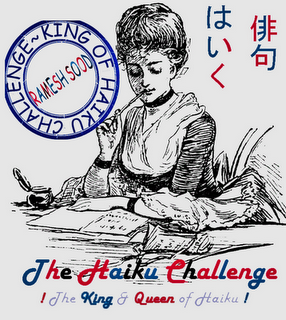 Wonderful chain of haikus - a crown befitting the award of a fine poet! Congrats on it! Congratulations Sir..! It is my pleasure!